This is the 1/32 Trumpeter F4F-4 build mostly out of the box less the excellent Eduard photoetch cockpit set 32 109 and Super Scale decals 32-200. Also, the big news is the use of Jerry Rutman's resin tires and wheel aftermarket parts instead of the dreaded kit rubber tires. I asked Jerry to make a set based on the kit parts with improvements and as usual, he responded with his outstanding skill. The Main Wheels and tires are one piece but will need kit part C33 to be trimmed down and used as a spacer for proper fit to the landing gear. He didn't have the gear struts in hand when he made the parts. 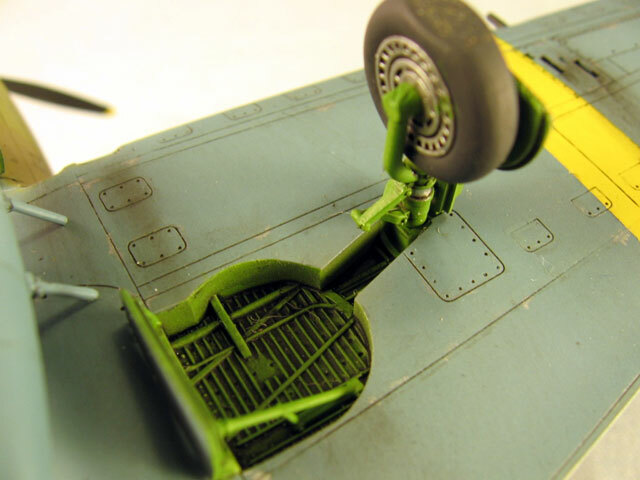 They work beautifully and include a tailwheel tire which fits onto the kit's tail wheel rim. It is a little jewel with carefully done ribs. The main tires are diamond pattern. Well done Jerry! The parts are available on his website. 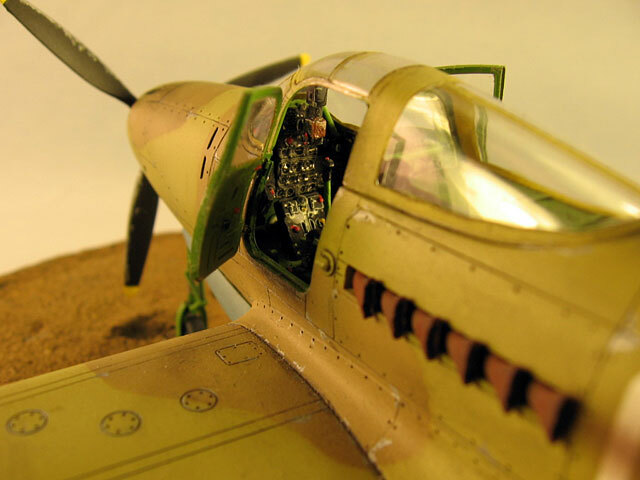 The Eduard cockpit was also used for this project. Note the very delicately done instrument faces. The photoflood lights are causing the compass to appear white. The aircraft depicted is from VF-9 flown by Lt. Cdr John Raby during Operation Torch, the invasion of North Africa in Nov 1942. I have always liked the yellow surrounded national insignia and the simple yet attractive blue grey and light grey camouflage. The kit's engine is pretty good and has a hand mixed blue grey painted engine case and aluminum painted cylinders highlighted with a dirty thinner wash. Bolt heads were picked out with aluminum paint. I even hand painted a tiny Pratt and Whitney eagle insignia on the engine case below the prop shaft! You have to be nuts to do that kind of detail painting. 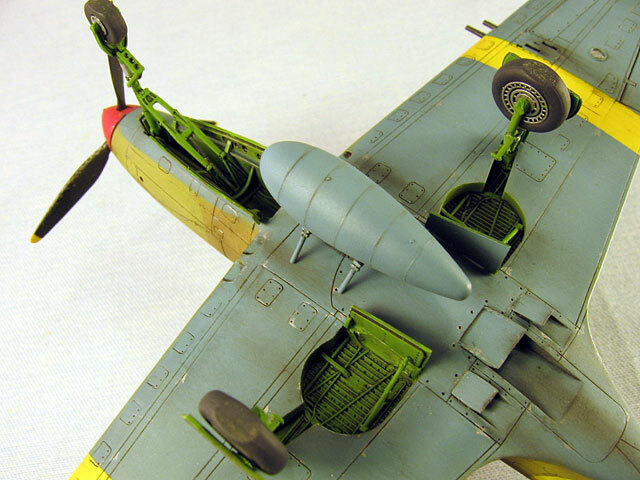 I used model Master paints throughout with FS 36164 used on the upper surfaces, with FS 36320 on the lower with a mix of both to lighten the fabric control surfaces and do an overall spray for weathering dulling of the paint. I have weathered the wing with dry brushed shoe scuff marks and Flat Aluminum paint weathering. 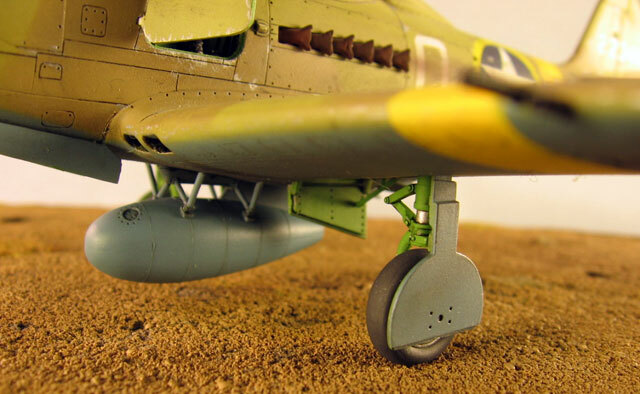 I didn't go crazy with weathering since this was early in the war and the airplanes were relatively well taken care of. I added with oil stains and exhaust stains to the underside. I love doing these and the great effect that always comes from this type of weathering particularly with radial engines. The exhaust stain was mixed from Model Master Flat Black and Very Dark Grey. The oil stains were a wash made from Burnt Umber and a bit of Flat Black. I use regular airbrush thinner for washes but it would be safer to used oil paints. 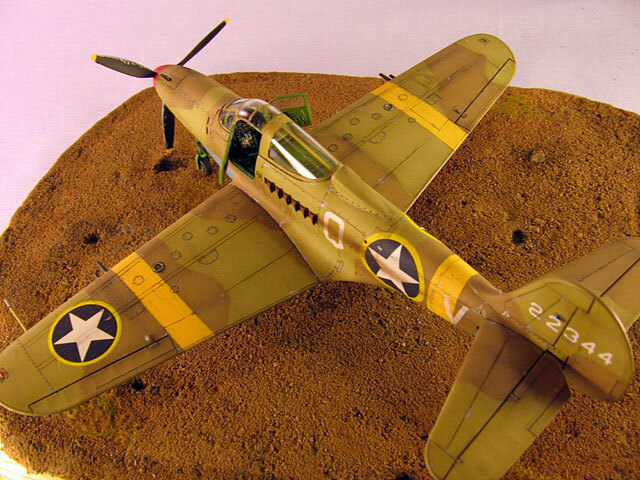 You must use thinner based washes carefully not to damage underlying paint. Overall I was pleased with the kit's fit. It was a three month quick build (by my standards), and it displays nicely. I recommend it. 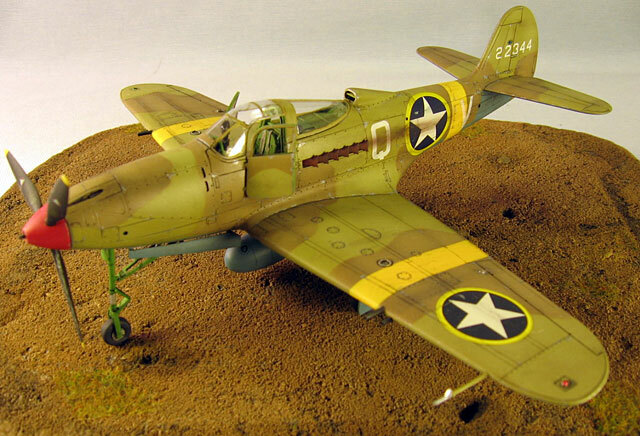 Now if Trumpeter would only make a 1/32 P-39 Airacobra !